In honor of my bff's b-day today, miss Vanessa Dina, (designer of Sweet Peach) I am featuring a shop in her home city of San Francisco. She lives in the Mission District, an area I've been visiting for over 14 years. It's one of my favorite sections of the city as the creativity and the passion store owners exude here is truly inspiring. This cute sign to Pot + Pantry lured me inside during one of our walks, where I soon realized this wonderful retail space was a haven for any chef or lover of pretty home items. With just 250 square feet to work with, owner Donna Suh Wageman manages to create an inviting space full of color and nostalgic fun. 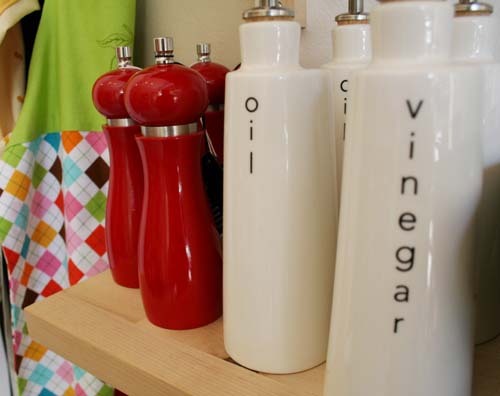 Offering new and gently used kitchenware, Donna explains, "My home is a mish mash of old and new and that's what my store is too." It's the kind of shop you just fall in love with the moment you walk inside. Donna's business philosophy is a fun change of pace as she offers buy and trade services. Although all her cookware is second hand, she is very picky on which items make the shelves. Gently used is important as well as high quality and stylish design. As Donna adds, "It needs to have personality and be durable." She remembers the days when she had trouble buying nice pots and pans because of the high cost. Now, with her economy friendly store model, Donna can offer customers well made kitchenware that won't break the bank. During my visit, Donna was featuring artwork by local SF artist, Alyson Thomas. She really liked Alyson's sense of style and quirky, meat inspired artwork, which includes this clever map you see on the right wall. (SF in the shape of a pig.) Funny enough, it's a perfect tie-in to Vanessa on her b-day...see her wonderful all meat inspired cookbook she wrote and designed here. Lucky for us Southerners, we don't need to live in SF to purchase Donna's stylishly affordable kitchen items by All Clad, Pyrex and Descoware to name a few. Just peruse and click your way through her always changing Pot + Pantry online shop here... and Happy, Happy Birthday to Vanessa!